Home > Personal Finance > Could Your High Interest Rate Be Illegal? When you apply for a car loan, a credit card or a mortgage you know you’re going to have to pay interest. The question is how much you’re willing to pay in interest to borrow that money: 5%? 20%? 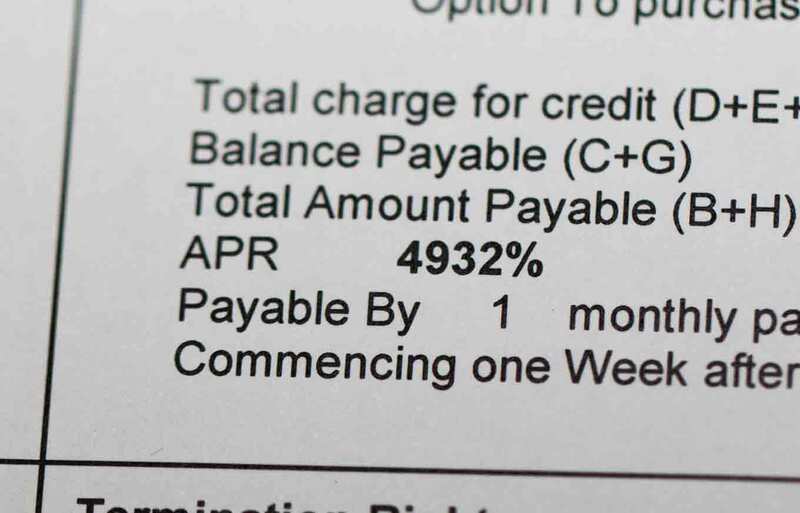 What if you were asked to pay 300% interest? When money is lent on a contract to receive not only the principal sum again, but also an increase by way of compensation for the use, the increase is called interest by those who think it lawful, and usury by those who do not. New York Attorney General Eric T. Schneiderman, for example, recently cracked down on several out-of-state lenders who allegedly violated New York’s usury law by charging residents interest rates ranging from 89% to more than 355%. In addition, 38 states have laws allowing small short-term loans, known as payday loans, according to the National Conference on State Legislatures. Some cap rates, but others don’t. As a result, rates on these loans can be very high — 300% to 1,000% or even more. There are efforts in some states to limit the rates on these loans to something more affordable to borrowers. costs required for billing, clerical, etcetera. luxury when they mess up. to take advantage of and devastate that consumer even more. the disparity shown to lower income people over the higher income people. for them, lowering their interest rates, removing fees and late charges. denied, or given much higher interest rates. bed to sleep on, or a stove to cook on, or fridge to keep food safe to eat. not get the good paying job they hoped for or not even one right away. issues, proves what leeches they really are. work with the lender, they can be charged the extra fees. consumers should, have to disagree that these companies are free of fault. limit -and knowing human nature- above their possible means? a clock to or even “Bank” (pun intended) on. that throws a whammy into our lives and finances that can and does happen. thought would happen, and it’s usually not a cheap repair. when all they are trying to do, is improve the quality of their lives. your greatest entertainment of these people/families slowly destroyed. These conversations are always funny to me. This is a product of a worthless American education system. If high school students leaned simple supply and demand and interest rates this would not be a conversation. Any Econ 101 student from a no name school will tell you, FREE MARKETS!!!!! Yes it’s a crazy thought but let’s actually use this prospective. So high interest rate companies compete against eachother just like. Any other good or service. The question is are they fixing prices? Are they colluding? No they aren’t if one of them could charge half the interest and take the others out of business they would do it in a heart beat. The fact is that the interst rate is at market equiblium if there are informed buyers. In reality why are these services needed? Well not everyone is born with money or family to borrow from when they are broke. Some people screw up there credit. What should these people do? Go homeless? banks will not give these people loans. So where do they go… Other lending institutions. let’s always talk about risk, the more risk is involved the higher you would expect your return as an investor. How is this different? If anyone has any question for me cause they are to socialist to understand I’ll be happy to give you my phone number and address so you can be straighten out by an American capitalist. Freedom !!!!! Jake, your education seems even worse than America’s, but it’s nice to see you did a class on basic econ. You realise human beings are led by emotions, not supply and demand principles, right? Your system, and all utopian economic systems, are based on rational decision making. And if our decision making was fully rational, we’d have little need for a utopian ideology like free markets. Secondly, you are talking about absolute free markets, where all buyers are fully informed and fully accessible to all services. You are also assuming there are no barriers to competition. You are assuming that consumers cannot be misled, misinformed or manipulated, and that individuals cannot be placed in situations open to manipulation. What about drug addicts? What about dependents? What about the desperately poor? What about those who don’t have full knowledge of the markets? You said it yourself, ” The fact is that the interst rate is at market equiblium if there are informed buyers”. Well, many buyers aren’t informed, or are misled. America always has been the land of the greed (Corp Greed) its sad. I bought a pair of chairs from west elm and decided to opt for the plan where I defer paying interest for a year. Then I forgot about it and didn’t really pay attention to my statements. I was paying way above the min payment on my [redacted] and thought I was doing well. So, a year passed and just this last month, I got hit with an accrued interest of $375.22 for a pair of chairs that cost $1505.63. In Feb 2015, my total balance on the card was $3197.83. I’ve paid $2509.79 in payments over the past year (made an additional purchase of $765.59) but it looks like they applied very little of that to the chair purchase. How can I resolve this. I am able to pay the cc balance in full but not sure I want to pay what [redacted] says I owe. After the minimum is met, the payment should go to the balance with the highest APR. If I pawned my car title for 800 and I chose to pay the most monthly payments 259.00 and I’ve been paying this for 11 months at a total of 2,500 already payed on time every month something just don’t seem right to me what y’all think.